This page will walk through how to use Observable in our Angular application. Observable belongs to RxJS library. To perform asynchronous programming in Angular application we can use either Observable or Promise. When we send and receive data over HTTP, we need to deal it asynchronously because fetching data over HTTP may take time. Observable is subscribed by using async pipe or by using subscribe method. To use RxJS library in Angular programming we need to ensure that we have installed RxJS. In case we are using Angular CLI, it installs RxJS by default. We can ensure it by checking package.json. If RxJS is not there in package.json, we can install it as following. To use Observable in our Angular application, we need to import it as following. Now we will discuss using Observable in our Angular application step by step with complete example. Angular HttpClient performs HTTP requests for the given URL. HttpClient works with Observable. Find some of its methods. Look into return types of the above methods, each and every method of HttpClient returns instance of Observable. When we subscribe to the Observable instance, then actual HTTP operation is performed. The Observable instances can also be executed using Async Pipe. Find the sample code to use HttpClient to perform HTTP GET operations. HttpClient.get returns Observable<any> but we can generalize it by our required data type, for example we are returning here Observable<Book> . Angular async pipe subscribes to Observable and returns its last emitted value. Here we will provide code snippets to use Observable using async pipe with ngFor. Step-1: We will create a method to fetch data over HTTP using Angular HttpClient in our service, suppose in BookService, as following. The above method will return Observable<Book>. Step-2: In our component we will create a property. Using $ at the end of property name is customary to define an Observable variable. Now we will call the service method and assign value to the allBooks$ property in our component. In our demo, we are calling the above method in ngOnInit. Step-3: Now we will subscribe our Observable variable i.e. allBooks$ using async pipe. We need to keep in mind that HTTP hit will take place only when we subscribe our Observable variable. In our HTML template we will subscribe our Observable variable i.e. allBooks$ using async pipe with ngFor. Here we will provide how to use Observable using async pipe with ngIf. We will fetch data over HTTP and will display it. We will show loading image while data is being fetched over HTTP. Step-1: We have created a method in service, suppose in BookService, to fetch data over HTTP for the demo. Step-2: In component we have created a property of Observable type. We will assign value to favBook$ as following. We are calling the above method in ngOnInit for demo. Step-3: Now we will display data in HTML template. We will subscribe Observable variable favBook$ using async pipe. A loading image will be displayed until we get response from HTTP request. After getting HTTP response, the book array will be iterated. subscribe is a method of Observable class. subscribe is used to invoke Observable to execute and then it emits the result. If we have an Observable variable that fetches data over an HTTP then actual hit to server takes place only when we subscribe to Observable using subscribe method or async pipe. Here we will discuss subscribe method to subscribe to Observable. Step-1: We have created a method in service, suppose in BookService, to fetch data over HTTP. Step-2: We will create a component property as following. Now in component we will subscribe to the Observable result of getBooksFromStore() as following. For the demo we are calling the above method in ngOnInit. Step-3: Now we will display our array softBooks in HTML template using ngFor. map is a method of Observable class. map applies a given function to the value of its source Observable and then returns result as Observable. map is imported as following. Find the code snippet how to use map in our Angular application. In the above code getFavBookFromStore service method is returning Observable<Book>. Using map we have converted it into Observable<string>. The component property favBookName$ will now only emit book name. getFavBookFromStore is defined in BookService as follows. favBookName$ can be displayed in HTML template as following. Find the code snippet to use map with subscribe. mergeMap is a method of Observable class. mergeMap emits Observable based on the given function. If inner functions returns Observable then final output will be the result of inner Observable emitted data. If it gets multiple request before completing one, then mergeMap maps values by combining those multiple inner Observable into one by merging their emissions. mergeMap is imported as following. Here we will create a sample example how to use mergeMap in our Angular application. 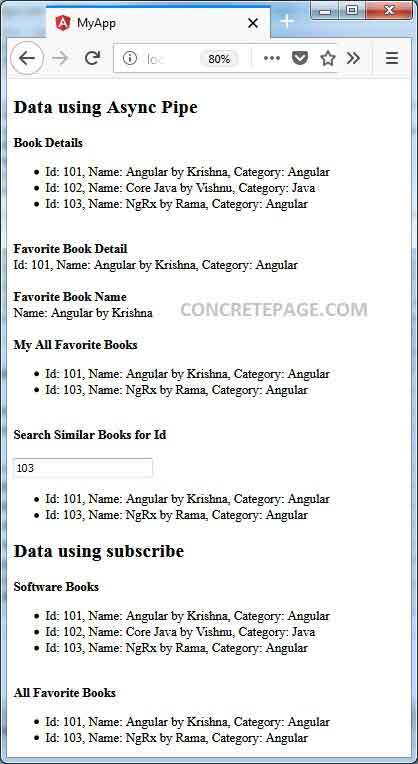 In the above code snippet, first we are fetching a favorite book using getFavBookFromStore method then by using this book's category we are fetching all books of same category using getBooksByCategoryFromStore method. Our service methods are defined in BookService as follows. myAllfavBooks$ can be displayed in HTML template as following. If we want to use subscribe with mergeMap we can do it as given below. switchMap is a method of Observable class. switchMap returns an Observable that emits data by applying the given function. If we have provided an inner Observable to our switchMap function then the final output will be emitted data by inner Observable. If switchMap receives multiple requests to execute inner Observable before completing the existing inner Observable, then it stops the existing execution and starts executing only the latest inner Observable execution request and keeps on doing so. The use case for switchMap could be search functionality where user keeps on changing search keyword before getting result and requires only result for latest search keyword. switchMap is imported in Angular application as following. Find the code snippet to use switchMap. In the above code getFavBookFromStore is returning Observable<Book> and on the basis of book category we are fetching all books of same category by using getBooksByCategoryFromStore that returns Observable<Book>. Our final output is the output of inner Observable and hence the final output will be of Observable<Book> type. In our BookService these methods are defined as following. Find the code to use switchMap with subscribe. of is a static method of Observable. of is used to create a simple Observable using data passed as argument. of is imported as following. For the demo, suppose we have a const value as following. We can convert bookDetails into Observable by calling of(bookDetails) . We can create a method to get this result as following. Then we can call of as Observable.of and we can write our method as below. To handle error in Observable, it provides methods such as throw, catch, retry. The method throw can throw custom error. catch method caches the error thrown by Observable and then it can either return new Observable value or can throw custom error using throw. The method retry just retries executing Observable for the given number of times. To handle error in subscribe method, the second argument of subscribe caches the error. Here we will describe all these error handling in detail. throw creates an Observable that immediately emits error. throw is a static method of Observable. It is used to conditionally throw error from map, mergeMap, switchMap etc. We can import throw as following. Find the sample code snippet to use throw in our Angular application. If we want to call throw using Observable, we need to import Observable as given below. Now we can call throw as Observable.throw. catch is a method of Observable class. catch method catches errors in the Observable to handle it by returning a new Observable or throwing an error. We can import catch in our Angular application as following. Find the code snippet to use catch. From catch block, we can return any new value or can throw error. a. Returning a value: If from catch block we want to return a value, we can do it by returning any Observable instance. b. Throwing error: If from catch block we want to throw error, we can throw error as following. In the subscribe method of Observable, second argument is to catch error. We can catch error in subscribe method while subscribing to Observable as following. When we have an Observable instance obtained from HttpClient methods, there could be scenario as following. a. If backend returns unsuccessful response codes such as 404, 500 etc then HttpClient will throw error with backend response code. b. If something goes wrong client-side, for example, an exception is thrown by RxJS operators or if network error prevents the request from completing successfully then actual Error object is thrown by HttpClient. We can check if error is of Error type or not by using HttpErrorResponse and accordingly log the error messages. HttpErrorResponse can be imported from @angular/common/http library as following. Now find the sample code to log error. //A client-side or network error occurred. //Backend returns unsuccessful response codes such as 404, 500 etc. retry is the method of Observable class. Some errors can be handled by just retrying request such as if errors are transient and unlikely to repeat. For example if we have slow network error and our request could not become successful then there are the chances to make request successful if request is retried. We can retry request automatically by using retry operator. It accepts number argument. Suppose we pass argument as retry(3) then the request will be retried for 3 times. retry is imported from RxJS as following. Find the sample example to use retry. To test our application we need Web Service URL. Angular provides In-Memory Web API that will provide Web Service URL. We can configure URLs with dummy data using In-Memory Web API. Find the steps to use Angular In-Memory Web API. 1. To install Angular In-Memory Web API, run following command. 2. Create a class that will implement InMemoryDbService. Define createDb() method with some dummy data. We will get following Web Service URL. 3. Before using In-Memory Web API we need to import InMemoryWebApiModule in application module and configure TestData class as following. Find the link for more information on In-Memory Web API. Note: NgRx is used for reactive programming in Angular applications. NgRx uses Angular with RxJS Observable. Find the link for NgRx examples.